Richard Twose was born in Devon in 1963. He studied 3D Design at the University of Creative Arts, Farnham from 1986 to 1989. After graduating he based himself in London and became a jewellery designer. For the next 13 years Richard sold his collections worldwide to stores such as Barneys in New York, Harrods and Harvey Nichols. He also designed bespoke collections for Ally Capellino, Margaret Howell and Paul Smith as well as designing one-off pieces for clients including Sting, Joan Collins, Theo Fennell and Charlie Watts of the Rolling Stones. During this period Richard was a visiting lecturer at the University of Brighton and Camberwell Art College, However in 2000, looking for new challenges, Richard decided to close his jewellery business and moved to a village south of Bath. Whilst teaching art and history of art at a sixth form college in Bristol he began to paint portraits. From 2009 his work was exhibited at galleries in Bristol and Bath. In 2011 he won the Victoria Prize at Bath’s Victoria Gallery and was invited to become a member of the Bath Society of Artists. In 2014 Richard was awarded second prize at the BP Portrait Award in the National Portrait Gallery. Ben Luke in the London Evening Standard described Richard’s painting as having an elusive, poetic quality. Since winning the award Richard has been interviewed by the critic Edward Lucie-Smith and was chosen by Jonathan Yeo to feature in a CNN Arts documentary “Ones to Watch”. Richard’s painting of Jean Woods was exhibited from June to September at the National Portrait Gallery and then in two other Art Institutions - the Royal Scottish Academy and Sunderland Museum and Winter Gardens. In 2015 he appeared in a film that accompanied the National Gallery and the Amsterdam Rijksmuseum’s major exhibition ‘Rembrandt, the Late Works’ where he demonstrated Rembrandt’s painting techniques. In 2018 this series was broadcast on ITV under the title 'Great Art'. Available on the ITV Hub. In autumn 2015 Richard was NOA Artist in Residence at the Royal College of Art. He began painting full time in his studio in a remote barn in Somerset. Portrait commissions in 2015 included Alice Prochaska, Principal of Somerville College, Oxford and Viscountess Rosie Grimston; the latest in an unbroken collection of family portraits that goes back to 1452. In 2016 Richard spent time with Gifford's Circus drawing circus performers during rehearsals, he went on to work closely with a group of acrobatic from CircoMedia, Bristol and observed and drew dancers during rehearsals for The Odyssey - Mark Bruce Contemporary Dance Company. In 2017 Richard's portrait of Ken Loach was selected for the BP Portrait Award and he was also commissioned by Oxford University to paint Ken Loach. This portrait was exhibited in the Bodleian Library and will hang permanently in the Examinations Halls. Richard also exhibited at Catto Gallery, London - Solo Exhibition A Flicker In The Continuum and the catalogue introduction was written by Edward Lucie Smith. 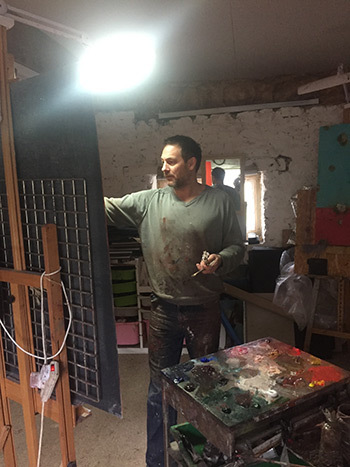 Richard is currently Artist In Residence at Elisabeth Frink's studio at Woolland House, Dorset.